Alyssa and Zachary Brown named their product, Moki Door Step, after the “moki steps” carved into the cliffs by the cliff-dwelling Pueblo people. They used small steps to scale the cliffs where they made their homes. While the Browns don't live in a cliff, they do lots of skiing, biking and kayaking. That means putting stuff up on a roof rack – something that's not always easy to do. When you load a roof rack, it's hard to get up and get good access to the roof. Standing on the car seat is tenuous at best. That's what led Zach to invent the Moki Door Step. It's a simple but ingenious product. 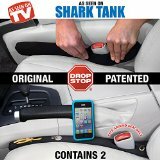 It's literally a small step that hooks securely onto the car's metal door latch. With the extra height, it's a lot easier, and safer, to make sure everything on the roof is secured properly. The Moki Door Step is touted as one of the top five “must have” auto accessories of 2018. After successfully funding the product on Kickstarter back in 2017, he roared into production and started selling it online. Zach has a patent for the product and it's selling well, so well it appears he's struck a licensing deal with a company called Rightline Gear to manufacture and distribute the product. Rightline makes and sells rooftop tents and car top carriers, so it's a good fit. Zach claims he did the deal so he could spend more time with his family and on his firefighting career. What he wants from a Shark remains to be seen. One of my friends actually has two of these. We use them when we're taking kayaks to the beach to bring bait to deeper water. I will admit, it makes getting the kayaks up on the roof of his (or my) SUV a LOT easier. I see a huge market for this and I think it will make Zach and Alyssa wealthy. I wonder about the licensing deal though. Usually, people come into the Tank to have a Shark help them get a deal like this. Whatever the case, it appears Moki Door Step is here to stay. Will Sharks Step Up and Invest? As I just said, I'm curious as to why someone would pitch a licensed product. Maybe it's a bad deal or maybe the deal is expiring. Maybe the deal came together BECAUSE a Shark was involved. I did notice the original was solid aluminum and the new version is now rubber coated for extra stability. Whatever the case, there's a back story to this licensing arrangement. If the segment was taped prior to the licensing deal, then a Shark may well be involved. Kevin and Robert do licensing deals – their bids are often contingent on it. Expect either Kevin or Robert to do a deal if there is no licensing deal in place during taping. If the current licensing arrangement was not a result of a Shark's involvement, I don't think Zach does a deal for Moki Door Step. Even if he does, it won't close when this licensing arrangement comes to light. I'm interested to see how this one plays out.